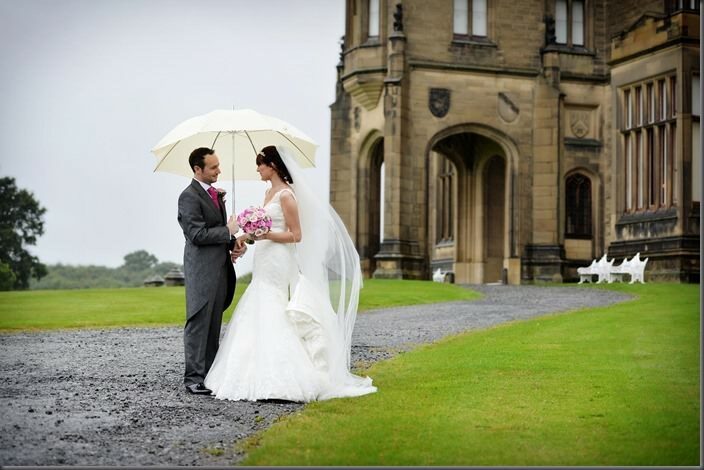 Emma and Dan chose a beautiful palette of pinks and lace for their classically romantic wedding at Allerton Castle. With images by Damian James Bramley of DJB Photography. Emma says: Dan and I work for the same company and had both been seconded to a role in India. Dan went out in February 2011 and I followed in May 2011. 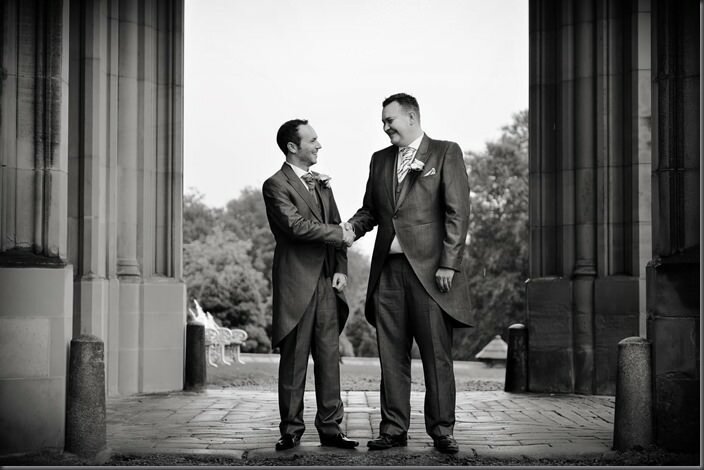 We knew of each other for a couple of years and had seen each other around the UK office but the first time we met and talked properly was on my first day, in the lobby of the hotel in Mumbai where we both lived for the best part of 18 months. We got engaged on 2nd May 2012, on a beach in the Maldives after a special meal on the anniversary of when we met, one year earlier. It was our first night in the Maldives, and we had a lovely romantic private dinner beside the beach. Dan ordered a bottle of champagne, but I had no idea what was about to happen. He was very complimentary, and then we went for a walk on the sand to the end of the paradise island. Dan hugged me, said that he couldn’t imagine spending a day without me, and then got down on one knee. I of course said “yes”, and he pulled out the most gorgeous engagement ring from his pocket that he’d had made in England months before hand. We returned from working in India in September 2012, and started looking at venues in January 2013. 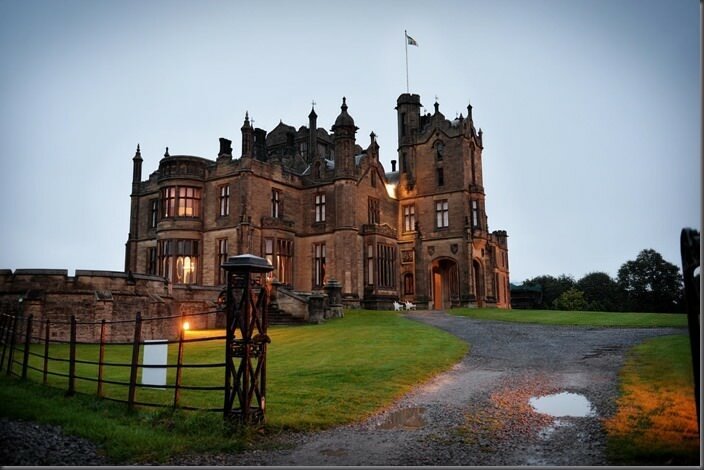 By the time we came to see Allerton Castle, all of the weekends over the summer we already fully booked. 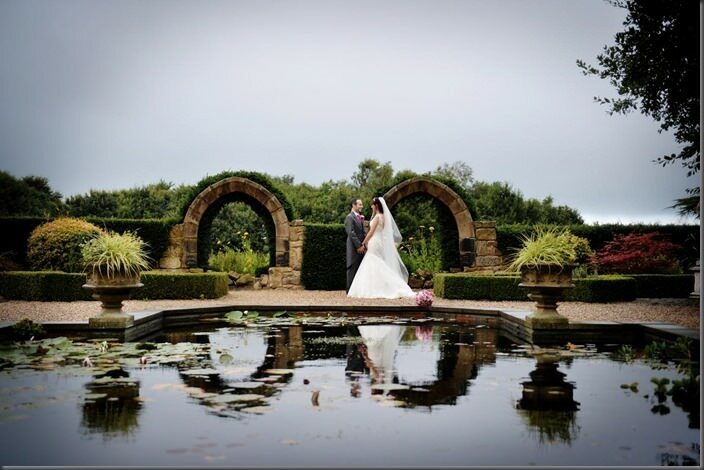 We didn’t want to wait until 2014, and Friday 6th September was one of the earliest dates available before the clocks went back and we wanted maximise the time for photos in Allerton’s beautiful gardens and grounds. In hindsight, getting married on a Friday had some advantages in terms of suppliers being still available. 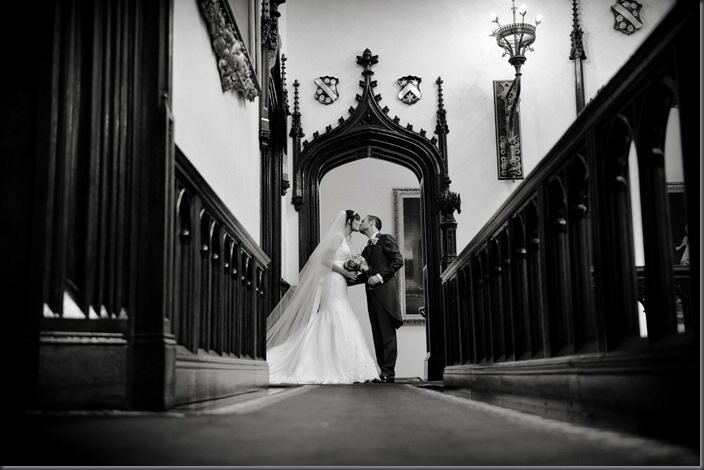 I cried when I walked in to Allerton Castle – we knew it was the one. The castle was having maintenance work done in the period just after new year; even in that state it looked amazing. 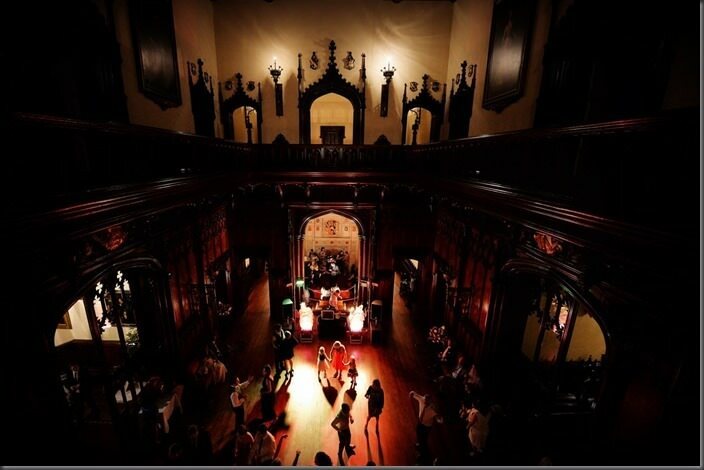 We sat by the open fire and marvelled at the Great Hall. That’s when the tears started. 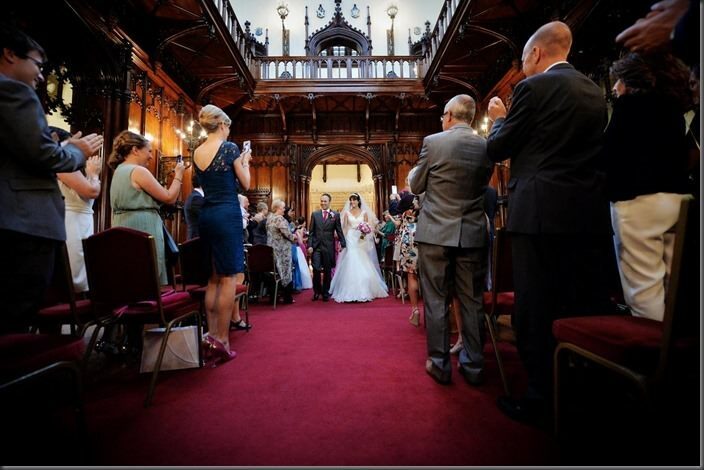 We loved it because The Great Hall has the feeling of a traditional church setting but allows a ceremony without the religious element which is what we wanted. 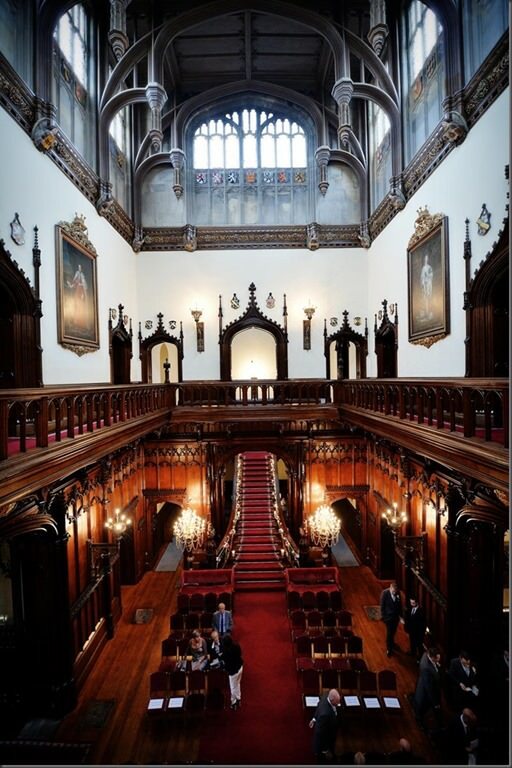 The staircase was such a spectacular and elegant way for me to enter – we could just imagine how amazing it would be. 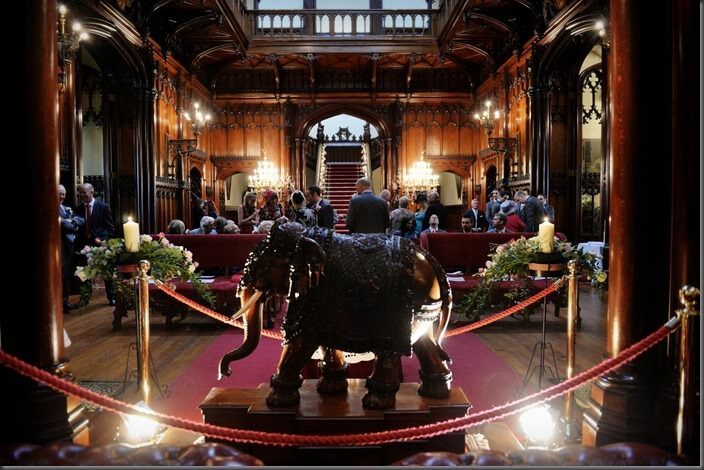 The carved wooden Elephant from India which couples are married in front spoke directly to us as it reminded us of where we met and the special time we’d spent together in India, it was like fate. 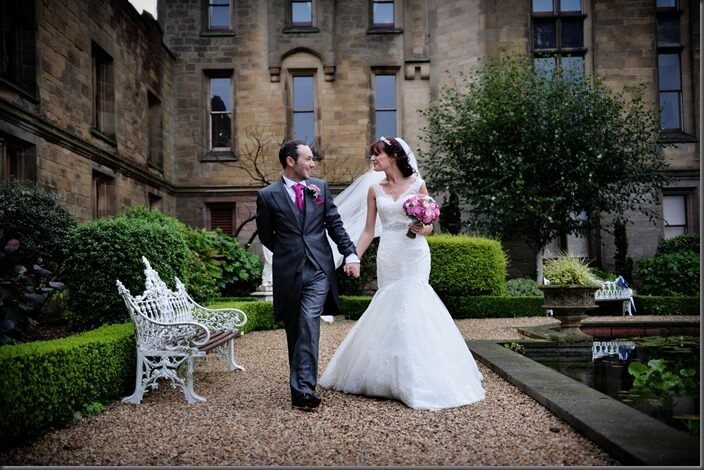 The grounds and location were private and it was great that the castle is for exclusive use of us and our guests. Also, because it’s so magnificent inside, we knew that we would have an amazing day and great photos even if the weather was bad (which it was!). To top it all off, the fact that the castle allows fireworks was a massive plus as most of the venues we’d seen prohibited them, and fireworks were something that I wanted. 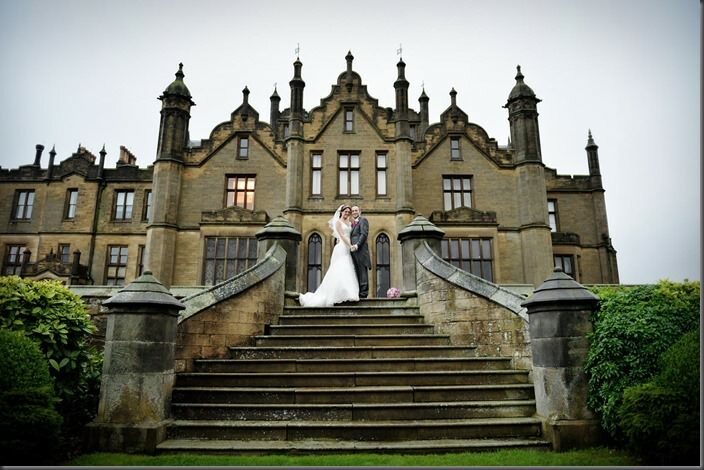 I would absolutely recommend Allerton Castle to another couple – the building and the setting are stunningly beautiful. 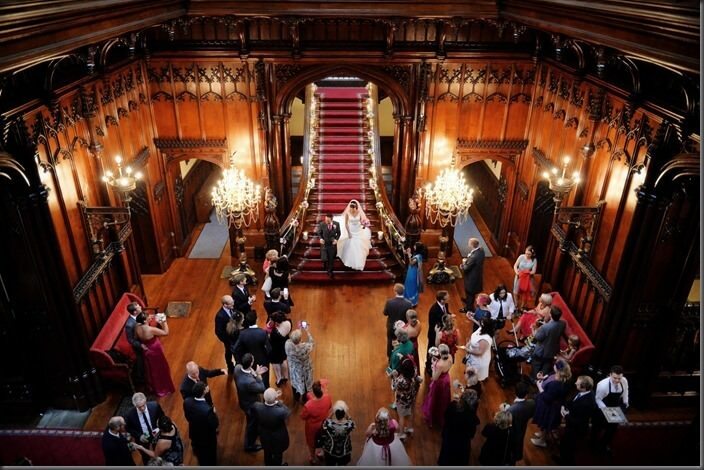 We’re sure that neither we nor our guests will ever forget the ceremony and my entrance down that amazing staircase. We and our guests were really looked after by the Dine team throughout the day. They seemingly effortlessly arranged and moved us between rooms, the flow of the day was never rushed and allowed us to fully enjoy every moment. We and our guests loved the food, which was a delicious menu and presented beautifully. 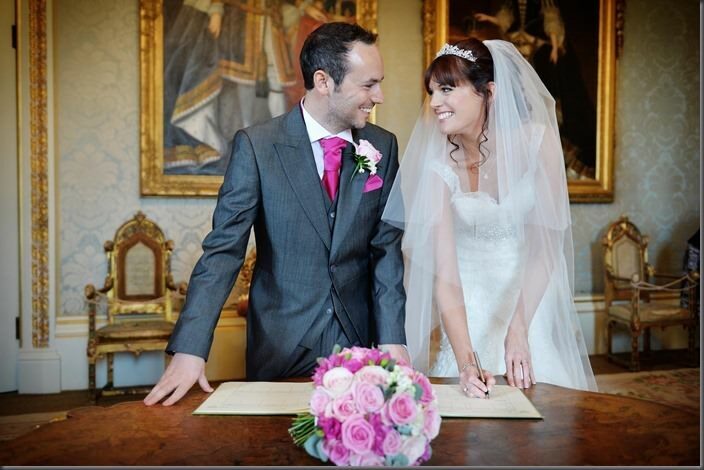 We loved every minute and will always remember the day fondly. 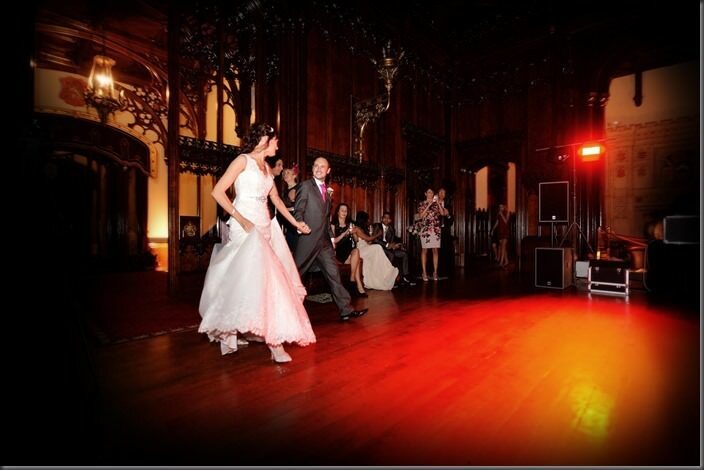 Our guests had complimented the venue, with many saying that it was the best wedding they have ever been to! 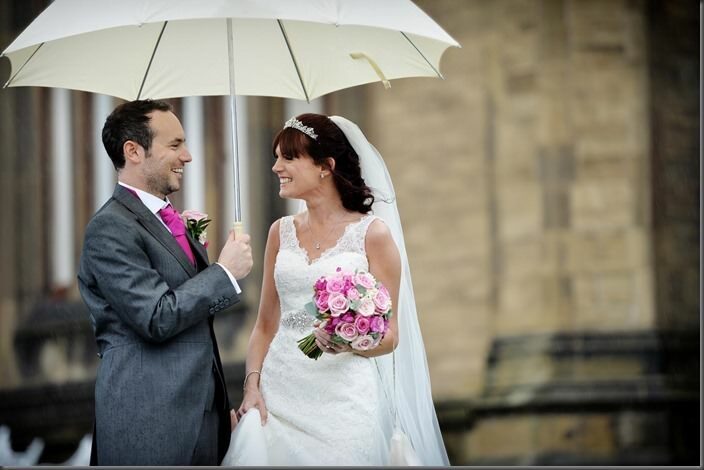 It rained nearly all day on our wedding day, and so we had the drinks reception inside the great hall, instead of in the gardens. This really didn’t matter though, as it was easy to find people for the group photographs (which took place in front of the staircase instead of the gardens), and when it stopped raining early evening Dan and I went out into the gardens for photographs on our own. Sophie was our Dine event manager. Both she and Lyndsey always made themselves available to answer any questions that we had in the planning of our wedding. 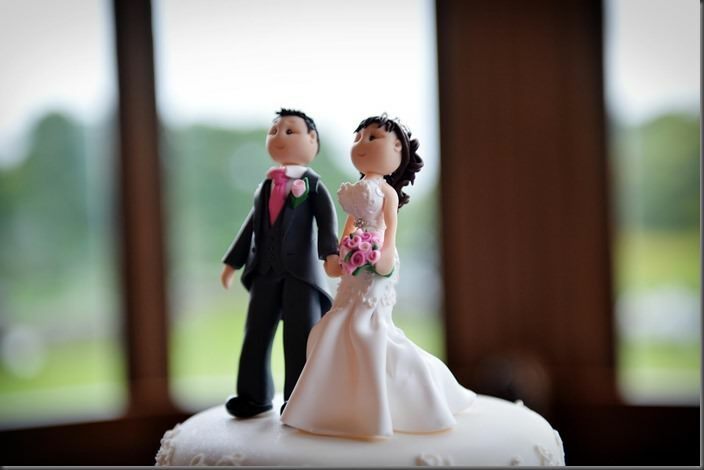 They were very professional and organised, and on the day we didn’t have to worry about anything. Their friendly and cheery nature also made it more relaxing for us. 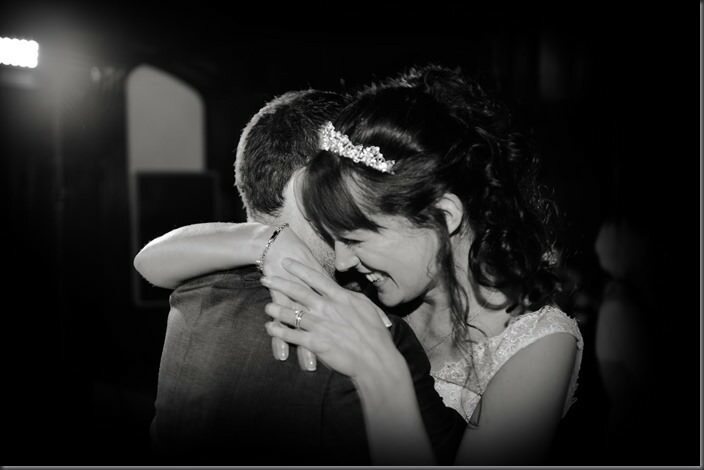 I would definitely recommend Dine to another couple – they were very professional and extremely helpful in the planning and execution of our wedding. The food was superb. 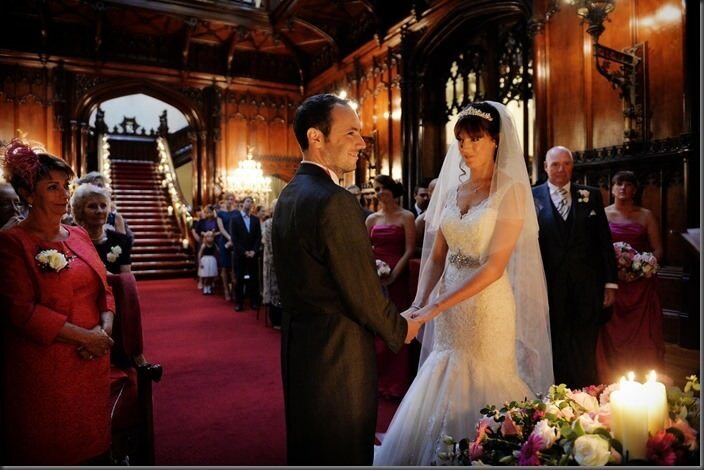 My dress is called “Charlotte”, by the designer Sottero and Midgley. I knew from the start that I wanted a lace dress, and after visiting a couple of shops and researching on the internet, I discovered that Sottero and Midgley have a large range of stunning lace dresses. I tried various dresses, but knew immediately that this was the one. I even tried a few more, just to be sure, but always came back to this one. I wanted straps, and just loved the fishtail shape. The diamante belt also was great to add something a little extra. My sister, mum and maid of honour saw me try on various dresses; their reaction to the “Charlotte” dress also confirmed my choice – my mum was speechless! 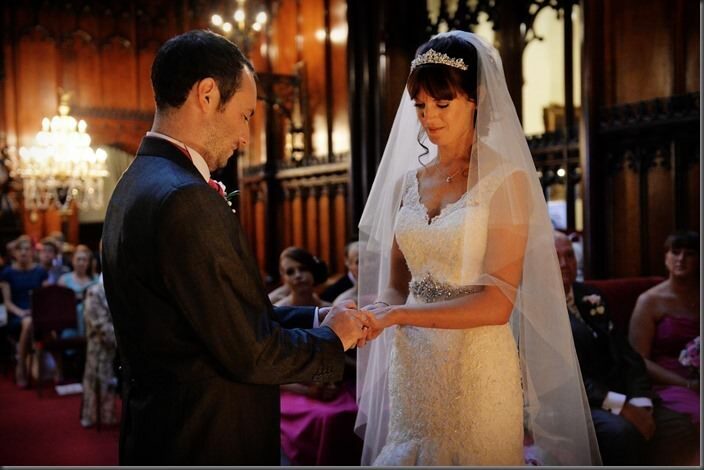 We bought the dress from a shop called Casamiento in Barnsley. 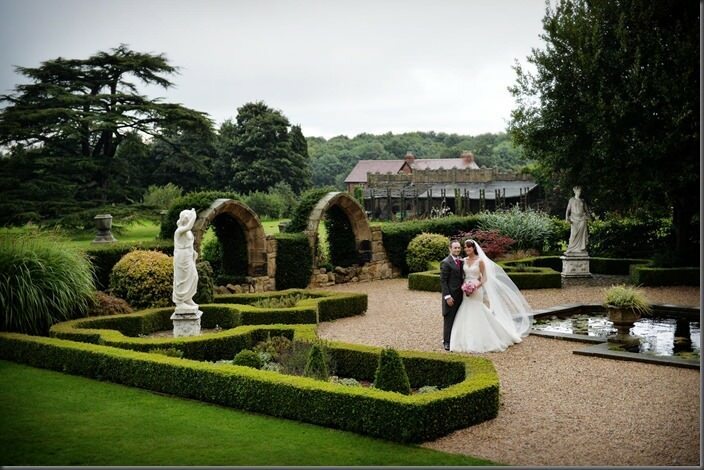 They have many Sottero & Midgley dresses, and being close to where my family & maid of honour lived, it was the perfect place to go. The staff are very friendly and we had fun at the dress fittings! 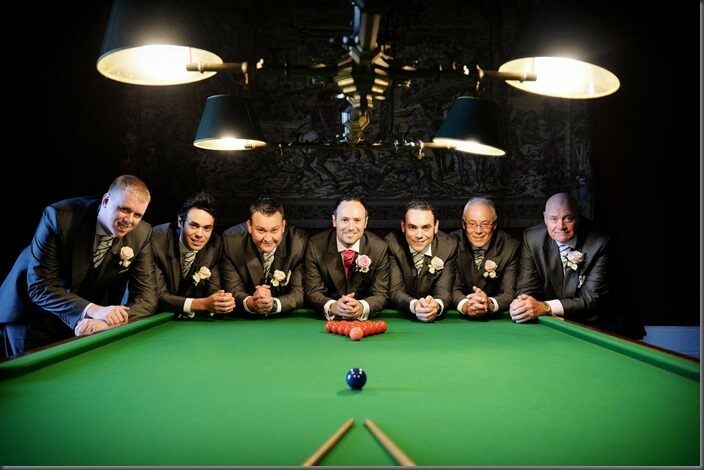 The Groomsmen wore Grey Silk Tails from 1860 Suit Hire at Greenwoods Menswear. The Bridesmaids wore dresses called “Posy” by Romantica of Devon. They were Fuchsia satin, with flower girl and junior bridesmaid in matching bodice with a big ivory puffy skirt. 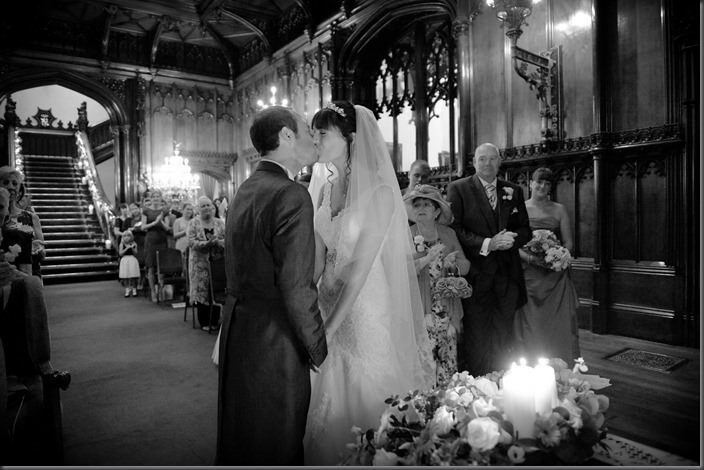 Our florist was Jill Springall. 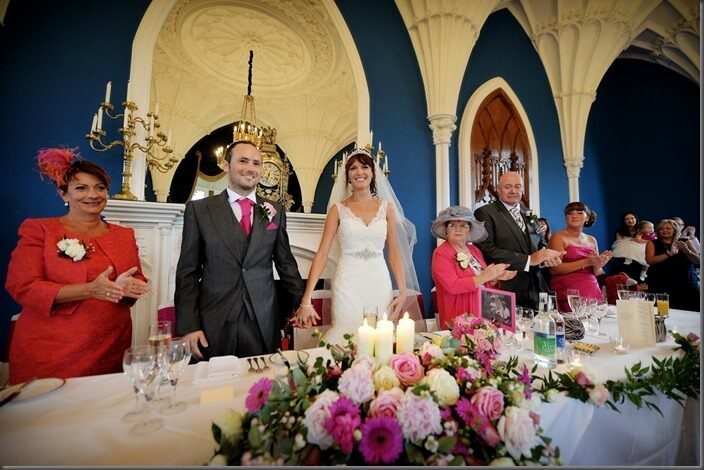 Jill gave us beautiful Bouquets multiple shades of pink and ivory Roses, Freesias and Bouvardia. 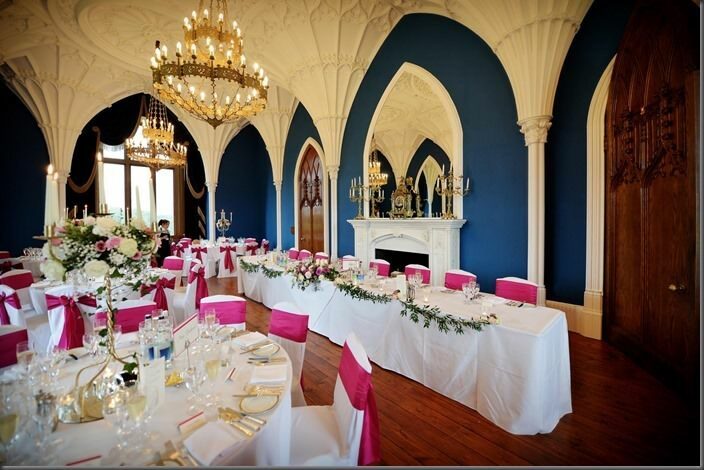 She took the colour palette through to our table candelabras, ceremony pedestals and arrangements for the ceremony table, which was reused in the wedding breakfast for the top table. Jill also decorated the staircase, decorated our cake and provided buttonholes for the Groomsmen and corsages for our mothers, grandmothers and my sister. Jill did a fantastic job, we met with her to discuss ideas on a couple of occasions. Jill was always helpful and guided us in an area that we don’t really have much knowledge of. 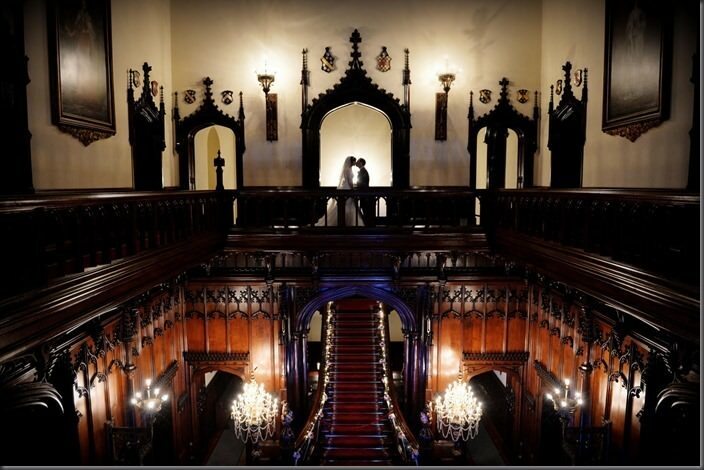 The castle looked extra specially stunning and many of our guests complemented us on the floral arrangements and bouquets. 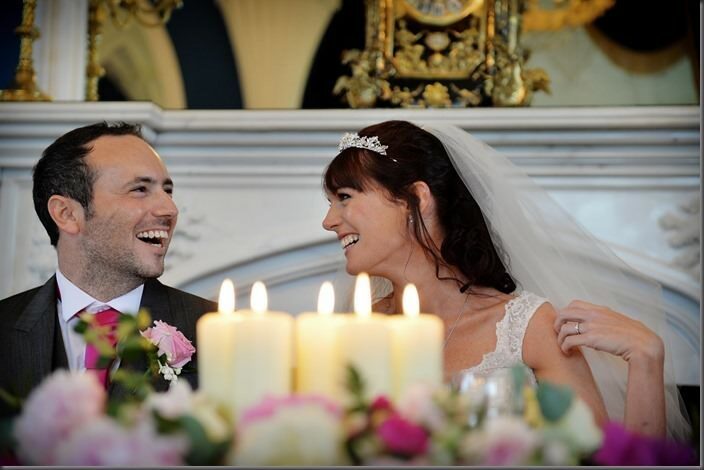 My hair was by Caroline Gerdes at Bgorgeoushair (a mobile hairdresser from Harrogate). 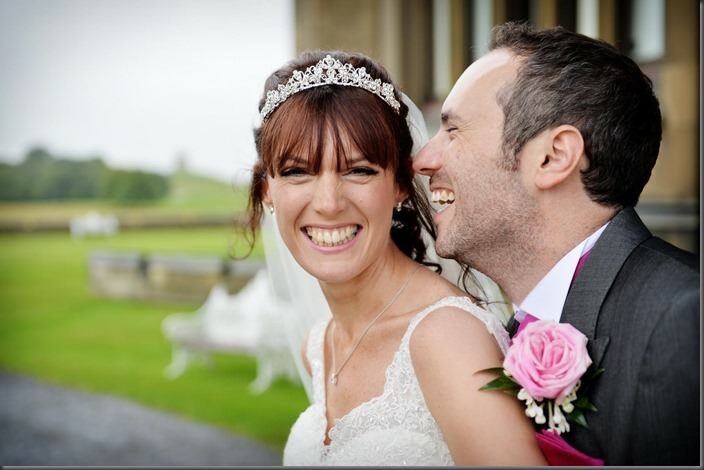 Caroline did some of the bridesmaids hair at our hotel in Wetherby and then travelled to the Castle to do mine. She patiently waited until I was in my wedding dress so that she could put my veil in and do a final check of my hair. Much appreciated! My make-up was by Melanie England. She’s based in Harrogate, but travelled to my hotel in Wetherby early morning to do my make-up. Mel was the 2nd make-up artist that I had a make-up trial with. She was great. She understood the natural style that I was aiming for, advised regarding colours and style, and was very friendly and attentive throughout. During the ceremony and drinks reception, Trio Vivo from The Event Music Company played a mix of contemporary and traditional music. We chose to have a DJ for our evening reception. Jon Starkey from Exclusive Entertainments played a really good mix of music to get our party going. 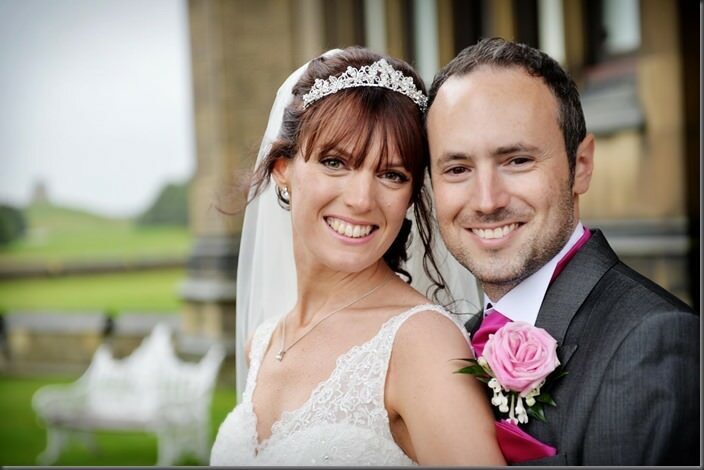 Our Photographer was Damien J Bramley of DJB Photography and we would recommend him to any Bride and Groom looking for someone who takes very natural photographs, who is discreet in his style, comfortable to be around, polite, courteous and professional. We’d highly recommend taking Damien up on the pre-wedding shoot. This shoot gave us a great opportunity to meet and get to know each other. Try out different styles and feedback what we liked or didn’t enjoy doing. We also got to talk through the day with him and any special details or particular shots we wanted to get on the day. 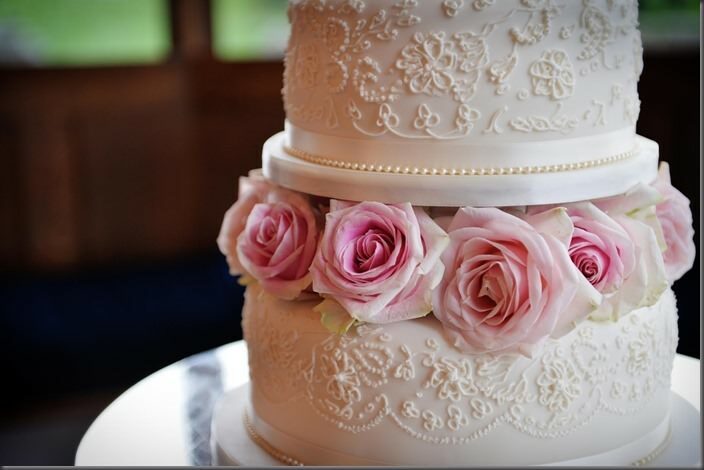 Our cake was traditional three tier pillared cake with Roses set between the bottom and middle layers. The bottom layer was a fantastic fruit cake, followed by a delicious lemon flavoured sponge for the middle layer and an extra special chocolate orange sponge for the top tier. 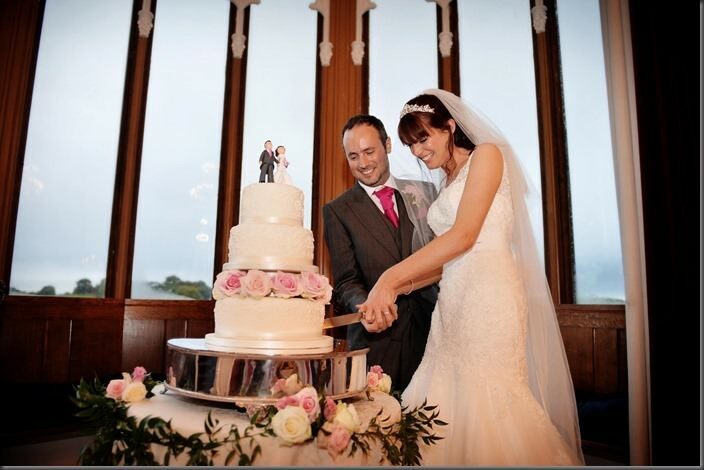 Our wedding cake was made by Paula Doody, at The Perfect Cake Company based in Leeds. We wanted a menu which would appeal to everyone. We tried to do this without going down traditional routes and opted for a Starter of Smoked Salmon, Main Course of Dine’s Cumberland Sausage and Mashed Potatoes, and Chocolate Fudge Cake for dessert. All of our guests complimented the food and Dine served us a tasty and very well presented three courses. In the evening we served our guests a Hog Roast and Halloumi kebabs for any vegetarians. The hog roast in particular really went down well with our guests! 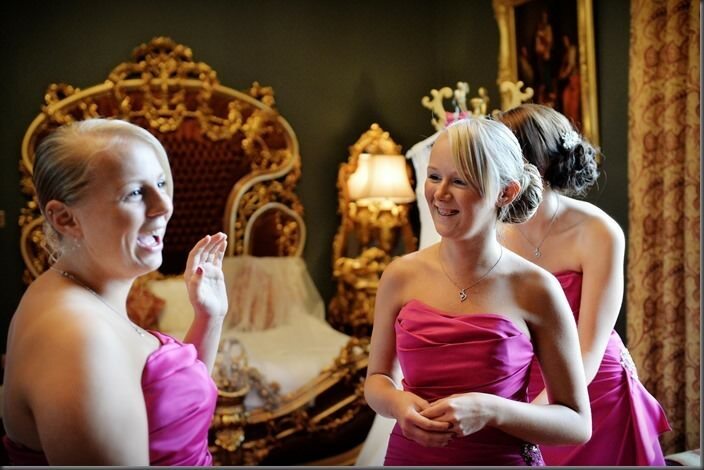 We choose Raspberry Taffeta Chair covers by Chair Covers of Yorkshire. 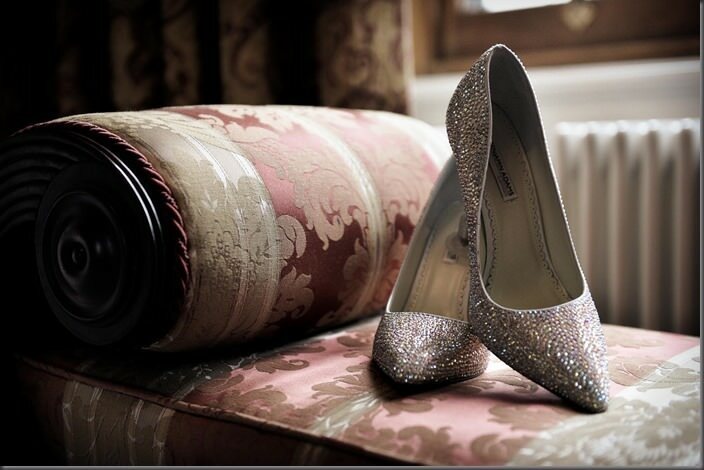 We chose this company, as they had a colour that was closest to the colour of the bridesmaid dresses. 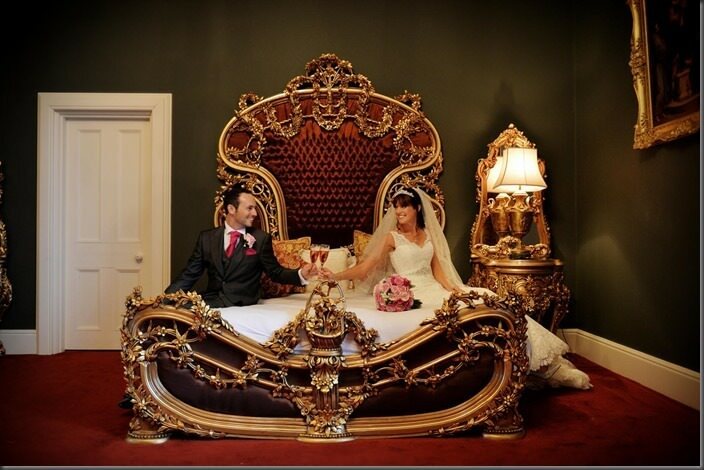 The chair covers looked lovely; we would recommend this supplier. Ferrensby Fireworks provided an amazing colourful five minute firework display for us. This was definitely one of the highlights of the day. The staff were very friendly and advised regarding colours etc. – we would definitely recommend them! 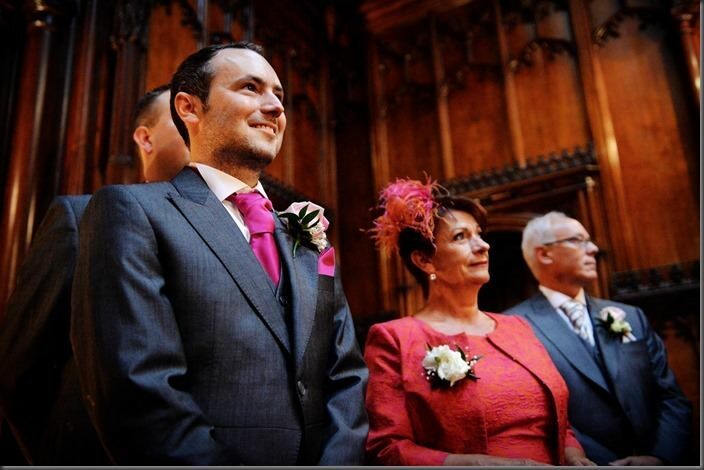 My favourite part of our day was walking down the aisle to see Dan in tears. I will never forget his reaction. 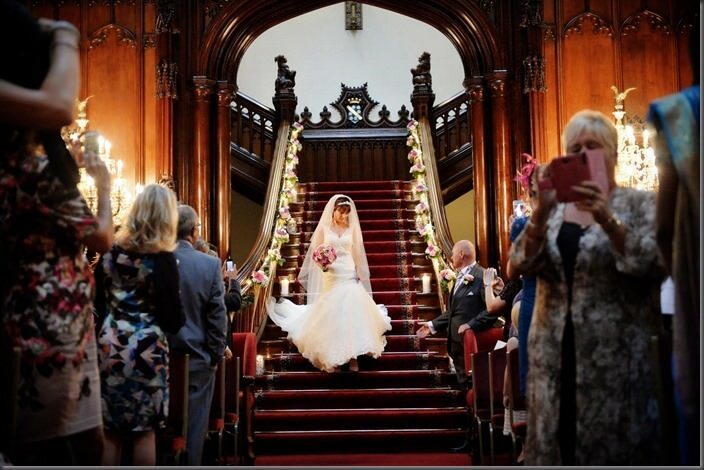 I think the bride’s entrance down the staircase adds a dramatic element to the ceremony that other venues don’t have. This was also Dan’s favourite part of the day, and i think it took him by surprise about how emotional this was. 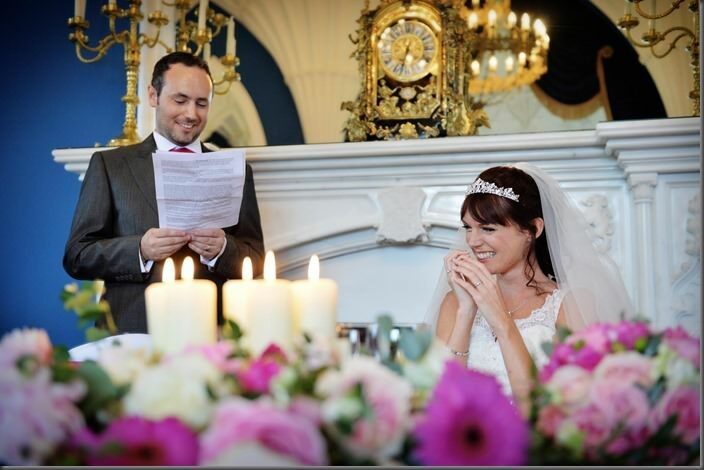 Dan also wrote a poem about our time together as part of his Groom’s speech which was very thoughtful and funny. 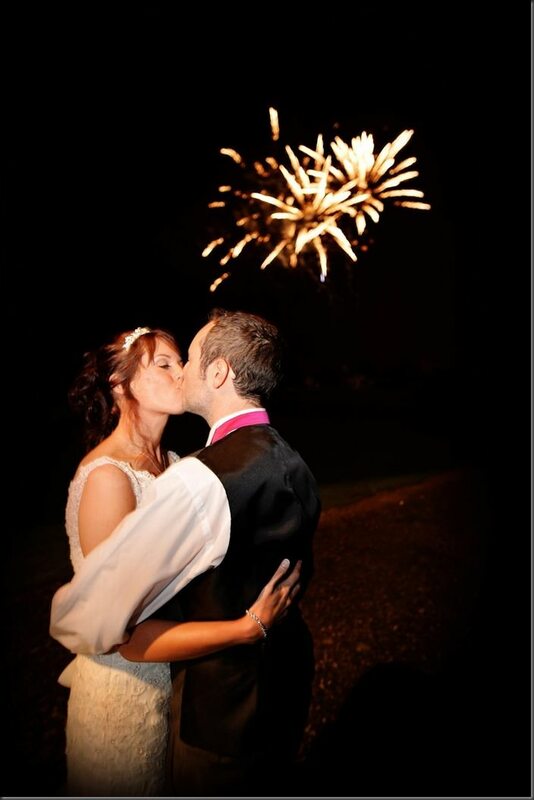 Our guests commented on how romantic our wedding day was! For our honeymoon we did a trip around California. Taking in San Francisco, Yosemite National Park, Los Angeles, Las Vegas and the Grand Canyon. It was nice to go west as Dan and I travelled much of Australasia and South East Asia during a two month trip after we finished working in India. It was great to have a mixture of cities, national park, beach etc. Dan and I love trying to see as much as possible, and so this trip was perfect for us (although not much time to relax!). My biggest tip for other Brides & Grooms would be regarding the wedding day itself, and just to enjoy every single minute. All of the planning is done by the actual day, so just relax and enjoy. Even if something goes wrong on the day (e.g. 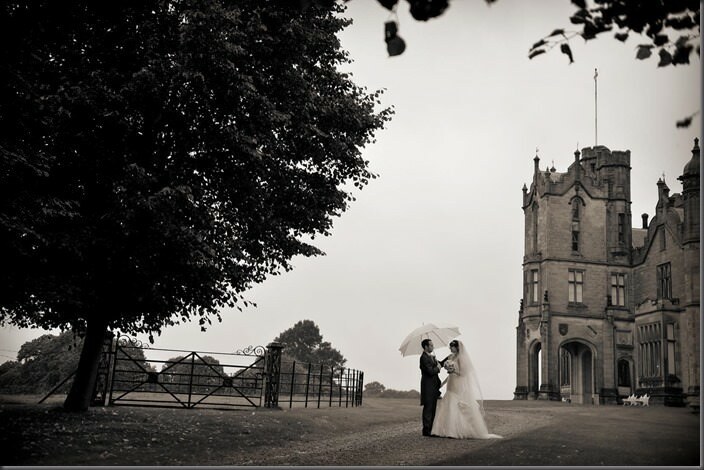 it rained on our wedding day), it doesn’t matter. All that matters is that the couple get married and have a day to remember! The day will go so fast, with lots of different aspects to it, so try and take time to take it all in, and make sure to grab some time just the two of you. Dan and I had photographs on our own in the gardens and upstairs in the Castle which was a lovely way to spend a few moments just the two of us to let it all sink in. We also tried to stay together as much as possible when greeting our evening guests. 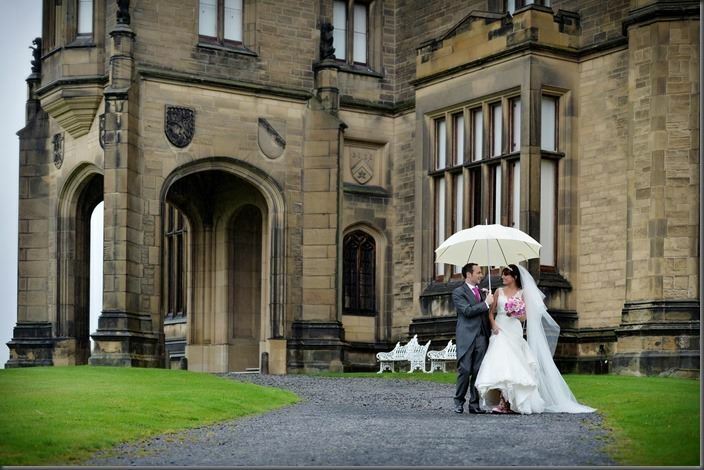 Contact us to find out more about hosting your own wedding or special event at Allerton Castle.